Onesta Create Firm Finish Aerosol / 10 oz. Onesta Volumizing Conditioner / 9 oz. Onesta Hydrating Conditioner / 9 oz. Onesta Hydrating Shampoo / 9 oz. Onesta Volumizing Shampoo / 9 oz. Onesta Nourishing Moisture Masque / 7.5 oz. Onesta Hydrating Shampoo / 31 oz. Onesta Hydrating Conditioner / 31 oz. Onesta Volumizing Shampoo / 31 oz. Onesta Volumizing Conditioner / 31 oz. 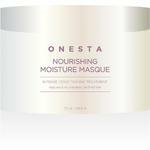 Onesta Nourishing Moisture Masque / 31 oz. Onesta Hair Care’s commitment to the environment and sustainability is as important as the products we make and ingredients we use. From using wind power to using recycled plastic in our bottles, we feel it is imperative to adhere to environmentally responsible practices in order to preserve what our planet needs to support future generations. Innovation in natural sciences and empowered decision making are changing the way we look at our hair and beauty products. Onesta is free of harmful chemicals, PETA approved, and a cruelty-free company. Discover just how great your hair can look and feel using pure, natural hair care products, rich in antioxidants and Certified Organic botanical extracts that revitalize, nurture and protect your hair.